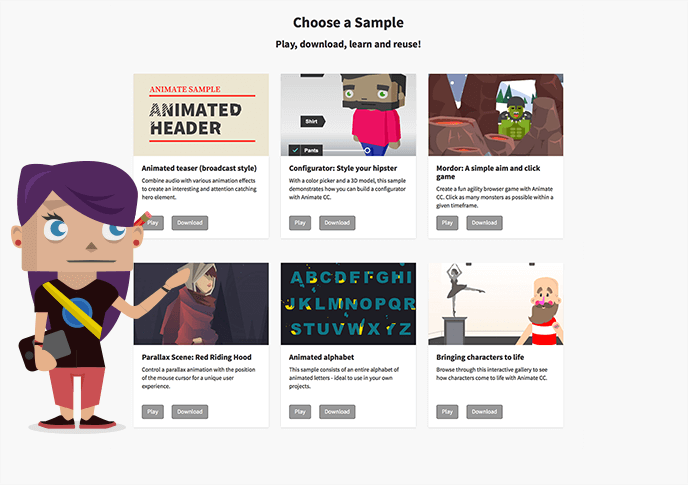 Your free resource and asset hub for Adobe Animate CC. Our mission: Helping the creative community to get started by providing samples, tutorials and extensions. Tour de Animate is made for you - the creative community - to get to know and explore the potentials and capabilities of Adobe Animate CC for the web. With Tour de Animate, we want to introduce you to this creative game changer. So don’t worry if you don’t know anything about Animate CC...yet. We have handcrafted a variety of samples. Each sample highlights at least one aspect which we considered to be crucial for getting to know the tool and its main areas: Creation, Animation, Interactivity. As leading experts, we have been exploring Animate CC from day one (prior to the actual release, even) to really get to know the tool inside out. Gathering a small team of creatives around us, we have now condensed our experience in these samples. The best thing about it: You can download every sample completely for free and use it in any way you like. There are absolutely no dependencies or strings attached. Feel free to change the visual parts of a sample or use parts of it in your own projects - even commercial ones. There are no limitations to it at all. So browse through the samples to get inspired! Download those you like best or get the entire starter kit! It's like looking the pro's over the shoulder: Open the projects in Animate CC to see how the samples are constructed. Modify and tweak the projects to get a feeling for effects and animations. Take them apart and use the components you need. They are perfect as templates and starting point for your own creative masterpiece! Don’t hesitate: Explore, Download, Create! Sign up and get yours! Your free resource and asset hub for Adobe Animate CC. Our mission: Helping the creative community to get started by providing samples, tutorials and extensions. Stay informed about new samples, updates and useful tips for Animate CC.